We are the only sellers in with this size in stock in the USA! 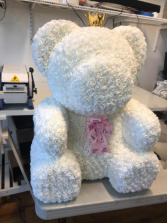 Give the gift of love with our newest 27" Big Teddy Rose Bear. 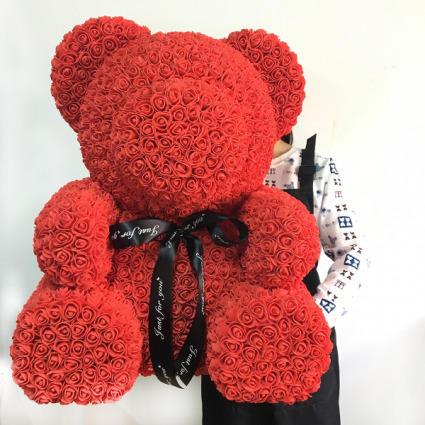 This extra large bear makes an impressive gift that will last a lifetime. 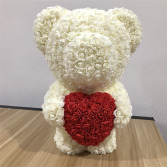 Over 500 handmade, soft, artificial roses make this teddy bear a one of a kind gift. Includes a premium quality protective, display box. Choose from red, pink, ivory or gray colors and now fuscia. Handmade rose by rose with natural looking roses. Pleasant and soft to the touch. Lasts a lifetime without any care. Comes in a plastic display case.